Home to 48 million people, South Korea takes great pride in its traditions and history. A great example is its delightful food culture that, despite having influenced by other cultures over time, has remained unique among the world's cuisines. Historians believe that the roots of Korean cuisine can be traced back to pre-historic Korean peninsula cultures. From then to today, Korea's food has changed tremendously. The expansion of Chinese religions like Buddhism and Confucianism influenced Korean vegetarian cuisine during 57 BCE to 668 CE. Ingredients such as lotus roots and soy bean sprouts became daily part of Korean dishes. In the 13th century, the dumplings (called mandu) were introduced to Koreans when the Mongols invaded the land. In Joseon Dynasty, a new style of eating was created—elaborate and fine royal court dining. Meals were prepared and served five times a day. Three of the meals were full courses consisting of twelve dishes ranging from vegetables to seafood, rice, and soup which were all served in a bronze ware. In Korean cooking, the use of bronze is quite prevalent; even Korean "chopsticks" or jeot ga-rak (젓가락) are often made of bronze. The other two meals of the day were lighter affairs; snacks and drinks served during the afternoon and late evening. Korean food culture has been able to thrive due indigenous innovation and the many cultural exchanges and contacts with other cultures and countries, especially Japan, China, and the United States. 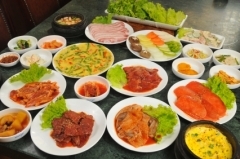 So what is there to know about the Korean food culture? Read on! Meat lovers, rejoice! It's no secret that Koreans love eating meat. Popular meats to grill are bulgogi (불고기), galbi (갈비) and sam-geyop-sal (삼겹살). Bulgogi, which translates as "fire-meat", is thinly-sliced beef that is marinated with soy sauce, sugar, sesame oil, garlic and pepper. Another delicious choice of meat is galbi, which are marinated beef short ribs. For adventure-eaters, try out sam-gyeop-sal. It is pork belly and pairs wonderfully when dipped into a spicy hot pepper paste known as go-chu-jang (고추장). 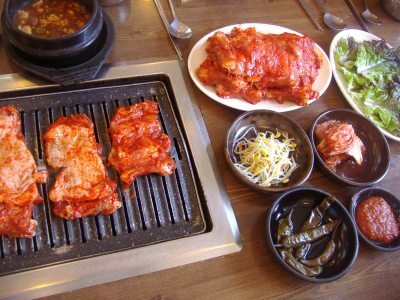 However, main course meat dishes are not what make Korean dining so different. No Korean meal is complete without the accompaniment of side dishes called banchan (반찬). 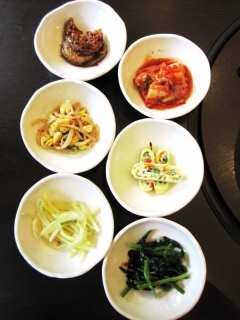 Banchan are different kinds of small dishes that are eaten with rice (which Koreans call "Bap"). Banchan are made from various types of vegetables and seafood and are meant to be shared at the table. This family style of serving banchan is a custom that goes back as early as the Joseon Dynasty (1392 - 1897 CE). In the not too distant past, it was a common sight to see rural Koreans exchanging gossip and news while growing, harvesting and preparing food for their meals. Whether the table was set at the royal court or at a farmer's modest home, sharing was a primary way of connecting with people. Astonishingly, there are over 100 varieties of side dishes. Here are some of the banchan that are commonly served in Korean homes and restaurants. The heart and soul, and the mother of all Korean side dishes is kimchi (김치). It is eaten every single day by most Koreans. 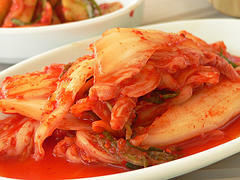 Kimchi is made with Napa cabbage (known as baechu (배추) which is fermented and marinated with seasonings. One of the reasons it became such an important food was because baechu can be harvested rather cheaply, and can be stored after marinating in clay pots year round. So over the course of history, Koreans turned this "always-available" vegetable into their own signature side dish. In the old days when 3 kingdoms ruled in Korea (57-668 CE), kimchi was marinated only with beef stock. However, later when Japanese invaded Korea (1592), the seasoning of kimchi completely changed. Japanese imported hot red peppers to Korea and flavoring changed to a combination of red chilli pepper flakes, garlic, salt, the shrimp pastesae-ou-jeot (새우젖). aek-jeot "fish sauce" (액젖), and ginger. More recently, many other kinds of ingredients are used, including Asian pear (Bae) puree, or anchovy sauce (Meyon-chee-aek-jeot 멸치액젖). Korean for herbs,na mool includes a variety of blanched, steamed, or boiled and seasoned vegetables. Typically, various types of vegetables are marinated with the following flavorings: soy sauce, sesame oil, salt, chilli peppers, garlic, green onions and sesame seeds. If you ever find yourself in Korea, try eating at a restaurant that serves Buddhist temple food. You can certainly count on being served dozens of different types of namool banchan. Despite similar seasoning ingredients, each namool banchan tastes deliciously different. Kong-na-mool (콩나물) are marinated soybean sprouts. Historians have found written records that indicate that kong na mool was eaten as early as the Goryeo Dynasty (918 to 1392). This banchan has a pleasant, mild, and slight nutty taste. Do-ra-jee-na-mool (도라지 나물)are bellflower roots. They can be eaten raw, but they might taste too bitter for first-timers. Once boiled and marinated, do ra jee na mool tastes even better. Go-sa-ree-na-mool (고사리 나물)are fern shoots are perhaps not pleasant on the eyes due to their brownish colors, but they have a delightful taste. Go sa ree na mool is both chewy and crunchy. Oh-jing-euh-chae bok-eum (오징어채 볶음) is an Asian fusion side dish that is popular with young kids. The sweet and chewy banchan is made from shredded dried squid that is stir-fried and marinated in a sauce made with go chu jang (chili pepper paste), 물엿 (mool-yeut, Korean sweet syrup), and minced garlic. O-daeng-bok-eum(오댕 볶음) are stir-fried fish cakes. O daeng bok eum can be mildly seasoned with soy sauce, corn syrup and sesame oil, or can be made spicier, by adding go chu jang (hot pepper paste). Meyl chee bok eum (멸치) are baby dried anchovies. Seasoned with olive and sesame oil along with corn syrup or sugar, this savory side dish is paired well with Korean alcohol drinks such as soju. Simmering (Jo-reem) is another method of making side dishes. Here are some of the popular jo reem banchan. Gam-ja-jo-reem (감자 조림) are bite-size white potato side dish that can be made sweet or spicy. It is a very common side dish which is simmered in soy sauce, corn syrup or honey (and in go chu jang if it's made spicy). Du-boo-jo-reem (두부 조림) is tofu banchan is simmered in soy sauce, sesame oil, minced garlic, chopped green onion and a dash of red chilli pepper powder. It's a simple yet an essential condiment eaten by Koreans. Yeon-geum-jo-reem (연근 조림) is a side side dish is made out of sliced lotus root mix with honey and corn syrup. Jeon translates to "pan-fried". There seem to be endless number of banchan that are cooked with this method. Here are some of the major kinds you will see in restaurants and homes. Hae-mool-pa-jeon (해물 파전) is a Korean version of a savory pancake. Lightly pan-fried with different hae mool (seafood) ingredients, Koreans love to eat this as an appetizer or as a side dish. A well-made hae mool pa jeon has a crunchy outside layer and a slightly chewy inside. A tasty way to enjoy this banchan is by dipping it in soy sauce. • Do accept the other person fill up your glass with alcohol. Koreans express their friendship by offering to fill or refill the glasses of the people they are socializing with. The proper way to accept this gesture of good will is by holding your glass out with both hands. It is good form to reciprocate the offer when the opportunity presents itself. It is considered very impolite to refuse such an offer. • If you really don't want to drink any alcohol, then just take a small sip when everyone else does to let others know you enjoy their company. • To avoid excess drinking is to leave your glass half-empty. If the glass is empty, Koreans feel obligated to refill it. • When drinking with elders, you show them respect by turning whole body to the side. Directly facing elders when drinking can imply you are challenging their authority. Now that you know the basic drinking rules, read on to learn more about the most popular types of sool in Korea. Think of soju as Korean version of vodka. Sool is colorless and smooth and clean in taste. In the past, soju was distilled from rice. However, in modern Korea, other ingredients such as potato or tapioca starches are also used. Typical alcohol content is about 20%. Common soju brands that Koreans drink are Chamisul, Chum-Churum and Ipsaeju. Since the late 90's, soju is often flavored. Everything from Korean yogurt to watermelon to green tea sojus can be found. These flavor sojus are a popular drinking choice among the younger Korean generations due to their milder taste and lower alcohol content varieties. Flavored soju is served in restaurants, pubs and karaoke bars. Due to their sweet fruity taste, this type of soju is easy to over drink, so first-time drinkers beware! This is a traditional rice wine which date back to 12th century. During that time, mak go ree was favored by farmers because it was cheap to make and buy. This rice wine is made of fermented boiled rice, wheat and water. Unlike the soju, mak go ree has an off-white milky color which has a slight sweetly sweet taste. It is an unfiltered drink, so do not be alarmed if you see bits of rice at the bottom of your cup. Traditionally, mak go ree is served on a large metal or wooden bowl from which the wine is ladled into individual bowls. The popularity of mak go ree has varied through time. In the late 90's, it became widely appreciated again. Today, mak go ree is commonly served in bottles. If you are looking for a popular brand, try out Kooksoondang. Bapsang (밥상) is a traditional Korean table setting style that rose to its height of refinement during the Joseon dynasty. In this table setting, all the food was served at once, not in succeeding courses. Bapsang typically consists of rice, soup, side dishes and either a seafood or meat main dish. In addition, the table setting can be called by different names depending on the number of the side dishes served. For example, if three banchan are presented the bapsang is called sam-cheop (삽첩). For five banchan, it is oh-cheop (오첩). For seven banchan, you say cheel-cheop (칠첩). For nine banchan, it's goo-cheop (구첩). For 12 banchan which was commonly presented for royal court dining, you call it sheeb-e-cheop (십이첩). Today, bapsang is displayed thus: hot foods would be placed on the right alongside the rice, and cold foods are served on the left. The side dishes are placed in the middle of the table, behind the rice. Unlike in European and American dining, Koreans use chopsticks and spoons, but no fork. Rice and soup are eaten with a spoon and chopsticks are used for everything else. As you may be aware, politeness and manners are taken very seriously in South Korea. These values are also applied when eating. So before taking one or several bites of the yummy-looking side dishes, impress your Korean friends and acquaintances with your grasp of Korean table manners. • Wait for the elder to pick up the utensils before you pick up yours. Politeness and respect are valued by Koreans. • Do say "jal-mok-get-seum-nee-da" (잘 먹겠습니다)before eating. It means "I will eat well." This simple sentence shows you appreciate the food given to you. • Do face away from the table when sneezing or coughing. Cover your mouth or nose with tissue, or your hand if you don't have tissue. • Do discard the uneatable part of the food (such as bones) discreetly on a tissue. Wrap the tissue so others won't see the remnants. • Don't pick up your rice bowl from the table. It's considered impolite and unsophisticated. • Don't hold chopstick and spoon at the same time. It translates to "I'm greedy to pick up the best part of the food!" • Don't use the utensils to rummage through rice or side dishes. Koreans view this as almost barbaric. There you have it! The next time you go out to eat Korean food, don't forget to use your new found Korean food culture knowledge!